A new book by a founder of the Palestine Liberation Organisation (PLO) and one of its leaders for 30 years, takes on a special significance in the light of the people’s uprisings in the Arab world. Review by Peter Arkell. It is with good reason that the Israeli government is so worried by the revolution in Egypt and the uprisings throughout the Arab world. "The peace treaty [between Israel and Egypt] was the most important factor for stability in the Middle East – and stability is the key thing," said Ilan Mizrahi, says a former head of Israel's national security council. And the recent revelations about the feeble stance, indeed the virtual collaboration, of the present leaders of the Palestine National Authority, in their negotiations with Israel, is revealed to be part of a long process of accommodation on the part of all Arab regimes. The uprisings are bound to change all that, and with it the fate of the Palestinians. Shafiq Al-Hout, outspoken but always honest, was one of the central group of leaders within the PLO who helped to formulate the early guiding principles of armed resistance to Israel at the same time as pursuing a strong diplomatic offensive, together with other Arab regimes if possible, for the right of Palestinians to return to their country. The creation of the PLO in 1964 was itself a critical breakthrough, as it brought all the different factions and tendencies into a single secular movement that represented all Palestinians. Palestinians, as refugees, were scattered all over the Middle East and the most important Arab country, Egypt, was little more than a pawn of the US after Gamal Abdel Nasser’s death in 1970. His successor, Anwar Sadat, signed a peace deal with Israel in 1979. The one country that had the clout and military strength to lead the Arab world on behalf of the Palestinians against Israel had been neutralised. Al-Hout resigned from the PLO in 1993 after the signing of the Oslo agreement. 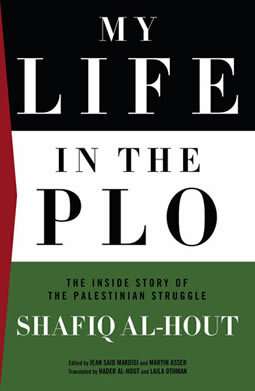 His memoirs, My Life in the PLO: The inside story of the Palestinian Struggle, explains how gradually, in the 1980s, he parted company with the policies of Yasser Arafat who, in Al-Hout’s view, was guiding the PLO towards an accommodation with Israel. At Oslo, the PLO recognised Israel, which in turn acknowledged the Palestinians for the first time ever. The PLO essentially accepted a two-state policy in which a Palestinian state of some unspecified kind would co-exist alongside Israel. He became the PLO representative in Lebanon, which had become the centre of the Palestinian struggle to win back their homeland after the Black September massacres and attacks by Jordanian forces forced them out in 1970. They stayed in Lebanon for 12 years until their expulsion by Israel and its allies within Lebanon in 1982. He saw his job as keeping a balance between three related but separate strands: the national one concerned with relations between the Palestinian factions; the Arab dimension concerned with making the Arab regimes recognise that Palestine and its people were an integral and inseparable part of the Arab world and thirdly, the larger international perspective of keeping the Palestinian cause in the forefront of the dealings of the major powers. Al-Hout survived ten attempts on his life by Israel and even one by forces allied to Syria. Writing was his passion and his hobby as well as his chosen weapon of struggle. What really comes across in the book is the near-impossible task of uniting the various factions within the PLO and the equally difficult business of keeping the governments of the host countries sweet and co-operative. In the face of a hostile Israel, always looking to expand, and supported by the US, relations with the host countries were always in crisis, especially over the question of the armed struggle. In spite of his organisational skills and his attempts to foster the sympathy of the Lebanese people and its government, Al-Hout was unable to prevent the slide to civil war in Lebanon, which was to last on and off for 15 years. The Israelis were continuing to mount violent raids against the refugee camps and other centres of Palestinian resistance. This had the effect of splitting the Lebanese people into those who continued to support the Palestinian revolution and those who wanted to appease Israel, led by the Phalange, a conservative and Christian outfit. Al-Hout tried desperately to win some of the leaders over or at least to neutralise them, but he concludes that the Phalange could have been kept neutral “only if the Palestinian Revolution had remained outside Lebanon. The moment Lebanon became the `host country’ of the revolution, this was no longer possible, regardless of how hard the revolution tried to impose limits on its undisciplined members”. And he writes about a third party, “Israel and Israel alone”, which deliberately stoked up the situation in the two years leading up to the war. The book goes to the heart of the PLO, to the people that made the decisions and to the discussions and meetings that helped to frame those decisions. Al-Hout had no particular axe to grind or faction to support, so his analyses tend to be reasoned and penetrating. He gives us his observations on Nasser, whom he admired, and met on six occasions. He describes graphically the Israeli invasion of Beirut in 1982 as it affected him and how he avoided capture. He agonises over the dreadful massacres at the Sabra and Shatila refugee camps by the Phalange forces while Israeli forces stood by, allowing the murderers into the camps. In a moving passage, he relates the scene when Israeli soldiers come looking for him in Beirut. His wife, Bayan, who had insisted on staying, lost all fear the instant the soldiers knocked violently on the door, he writes. She was questioned about where her husband was while a number of soldiers searched for documents. Her defiance is amusingly described. At one point the Israeli soldiers got excited about a list of names. “What are these lists? Are they the names of terrorists?” she is asked. “What you have,” she replies, “is a list of people you may consider terrorists, but I don’t think any of them are still alive today. They are members of the Palestine Conference that was held in 1927”. Al-Hout’s differences with PLO chairman Arafat came to the fore in 1983 during a session of the Palestine National Council in Algiers, the first one after the Zionist invasion of Lebanon and the subsequent expulsion of the Palestinians from Lebanon. “Gradually”, he writes, “the conference became transformed into a kind of popular festival, with speakers talking endlessly about the heroic operations that Palestinian and Arab fighters had staged during the war... But what about the central question on which the meeting had been convened in the first place: What now after the departure from Beirut?”. The conference was hollow and celebratory, he writes. Revolutionary slogans were allowed to cover up the real issues and there was little attempt to analyse and draw lessons from the Palestinian experience in Lebanon. “In essence”, he says, people wanted to know whether “liberation of the whole of Palestine was still our goal. If yes, how were we supposed to achieve it and through which strategy? Did we need Arab support or could we do it alone?” The resolutions, in his opinion, were “cheap carbon copies” of their predecessors and did not address the new changed situation, resulting in the leadership’s failure to fully grasp the dangers of the strategic setbacks it had suffered after its exile from Lebanon. In the face of the problems and continuing attacks against Palestinians in Lebanon and Syria, the leadership of the PLO under Arafat was pursuing a policy of courting Egypt and Jordan. This change of strategy, which Al Hout says came from Arafat alone, caused consternation within the factions and groups of the PLO, not least within Fatah. The deadlocked situation finally gave way to the Intifada or general uprising in 1987 throughout the occupied territories. Although Al-Hout was re-elected to the executive committee in 1987, he was unable to tolerate some of the things Arafat was doing as leader even though his “love and friendship for him were undimmed”. By the beginning of 1993, the list of crises the PLO was facing became ever longer with renewed pressure for unacceptable peace agreements. Corruption had also reared its ugly head. Al-Hout writes that he felt the leadership was on another planet and there was now “what resembled a shadow administration of ‘advisors’ and people who had insinuated themselves into the PLO. They were solution brokers and godfathers of secret communications”. He suspended his membership of the executive council and demanded that an emergency session be called in which all the crises should be discussed, followed by a vote on a motion of confidence in the current leadership. Shortly after, news of the Oslo agreement which had been negotiated in secret without the participation of the executive became public, and Al-Hout resigned in protest from the executive committee and as the PLO representative in Lebanon. He expressed his considerable surprise that only eight out of 120 members of the National Council had voted against the agreement. He was equally surprised by a poll of refugees in the camps that showed most people supported the peace initiative, desperate for a solution to their misery. Zionist intransigence, reinforced by unswerving American backing, has ensured that the so-called road map to peace was in practice a dead end. The revolutions of 2011 create favourable new conditions for the Palestinians in their long, historic struggle for self-determination. Shafiq Al-Hout died in 2009.